Thank you for visiting our new spot where Savannah Cat breeders can post their new kittens that they have available for sale! This will be a fantastic thing for, both, breeders and potential Savannah owners! We will be providing a way for breeders to share their cats with more people! How great is that?!? It is tough to stay visible on Google and Bing, especially for smaller, yet very high quality Savannah breeders. It takes time, man-power, money and a lot of internet savvy in order to generate first-page rankings. Instead, just On top of the extra exposure that you will receive, there is absolutely no cost to the breeders (or the potential customers). 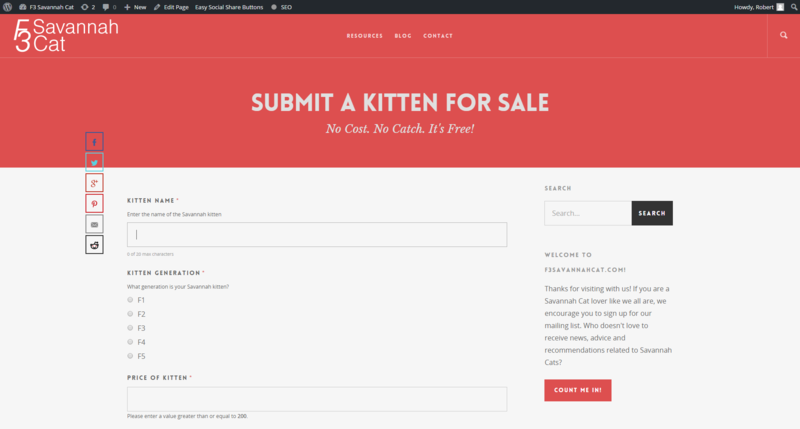 Breeders can post all of their kittens to F3SavannahCat.com so customers know what kittens are out there, what the pricing is, and who is breeding them. All listings will remain active for 30 days and can be re-posted an unlimited amount of times if necessary. The only thing we ask is that you post your kittens individually to improve the experience for potential customers. If customers know that each post item is just one individual kitten, it will make the experience much more clear for them! Head over to the Submit a Kitten for Sale page and add your kittens! What do you have to lose? One of the toughest things for potential customers is that there are a couple hundred boutique Savannah Cat breeders out there, and it is almost impossible to find them all via a Google search. How cool would it be if they could just go to one spot to see kittens from many breeders all in one spot?!? It would be very cool. It would keep things simple — and simple is good. That is the problem that F3SavannahCat.com is ready to solve. Free for breeders. Free for potential Savannah Cat owners. No headaches. Just the best resources on the Savannah Cat breed all in one place. This feature has just been added recently, so please check back frequently to see if there are new kittens available!